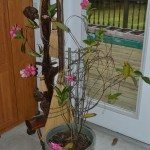 I live in Western Massachusetts and I bought two mandevilla plants. How do I care for the plants in winter season? Do I bring them inside? Yes, you will need to move them to a location out of the winter temperatures.